Delivered in 2011, the first phase converted the general hospital into university buildings for graduates and researchers in the Faculty of Humanities, Paul Valéry University. 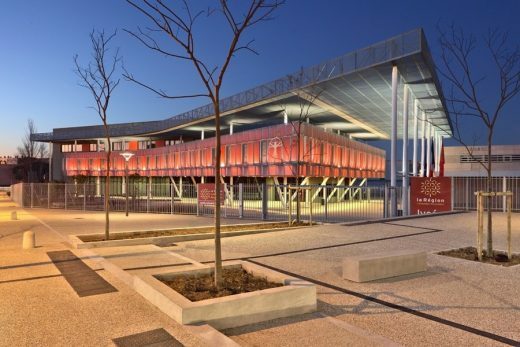 The French Architectural firm Hellin-Sebbag has designed a new main reception building for the Leonard de Vinci high school specialising in building trades. Conversion of a seventeenth-century hospital and listed building into a university with the modern functionality that a university requires. 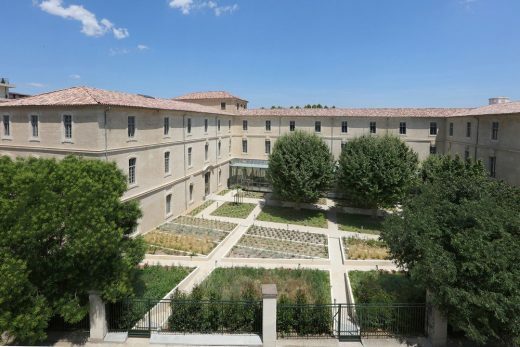 In a second phase, the Aile des Incurables, on the same site, will be converted into a Maison des Sciences de l’Homme and a department of archaeology. Brigitte Hellin, born in Belgium, and Hilda Sebbag, born in Morocco, met at the Grand Palais in Paris, where they were both students at the Unité Pédagogique d’Architecture N° 7. They presented their degree project together, graduating in 1983 from the Ecole d’Architecture de Paris-Belleville under the direction of Professor Henri Ciriani. They submitted winning projects for the PAN 13 new architecture programme in 1984, and for the Albums de la Jeune Architecture in 1988, and were soon being awarded public contracts in Fleury-les-Aubrais, Matha, Beautor, Rouen and Rennes. In 1988 they set up the Hellin-Sebbag architectural practice in Paris. The opening, in 1990, of a subsidiary in Montpellier meant the firm could respond to projects all over France. In 2009 the firm welcomed Benjamin Pirany as a junior partner. Born in Alsace, he gradated from the Ecole d’Architecture de Montpellier in 2005. Working with public and private institutional clients, Hellin-Sebbag now designs and builds collective housing and public amenities, characterised by innovative materials and careful execution. With a portfolio that includes several projects in Mediterranean regions, and more recently in Martinique, Hellin-Sebbag is particularly attentive to environmental quality that balances thermal comfort with energy-saving requirements. The firm’s architects have expertise in complex programmes such as renovating high schools (that remain occupied and operational during works), police stations and scientific research labs. They invest themselves personally in each project to engage directly with the client, establish their fundamental requirements, and respond not with the off-the-peg proposals of a large practice but a bespoke solution.